I am at my parent's place trying to do some watercolours on a miniscule work desk obviously made for a child. The desk is stuffed with bits and pieces of my various pasts and I have discovered a postcard...Back in 2005 I went on a solitary working holiday to St. Michael's printshop in St. John's Newfoundland. I was sad and trying to repair a bleeding heart. It was just what I needed, a trip steeped in fortitudes. I took my mother's fiddle and printing supplies and set to work. 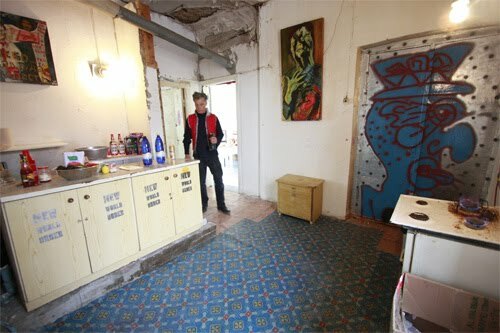 At the printshop I met Tom Hammick, what a great artistperson! He ended up writing me the most amazing letter of recommendation and I was accepted into Camberwell's awesome MFA print programme. I didn't go because I ended up being offered a sweet deal at Concordia in Montreal. And here is the postcard that has triggered my nostalgic remembrances. Here is a picture of Stan's Pine Cone Oscillator on view at Roadside Attractions. It's made with: pine cone, tooth pick, Stamp microcontroller, electronic components, lamps, multi-meter, motor, water with bottle and drain, clock, wood. What's up with Estonia? seems like a magical place. 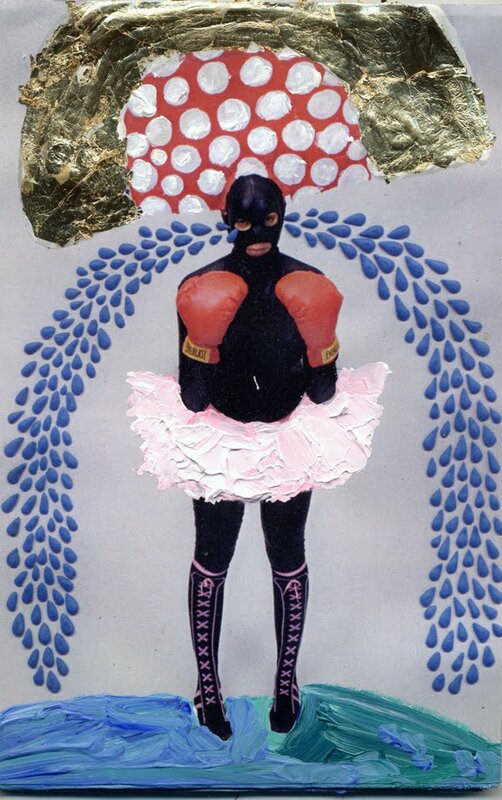 Exit Art announces Fracking: Art and Activism Against the Drill. Hydraulic fracturing (“fracking”) is a means of gas extraction that accesses gas trapped more than a mile below the earth’s surface. This exhibition, a project of SEA (Social Environmental Aesthetics), will expose this process of gas extraction that is contaminating water supplies worldwide. Through documentary videos, photography by Jacques del Conte and Michael Forster Rothbart, commissioned works, public responses and literature, it will engage the public in dialogue on this issue through public lectures and calls to action and encourage audiences to continue educating themselves and their communities on fracking and its detrimental effects. 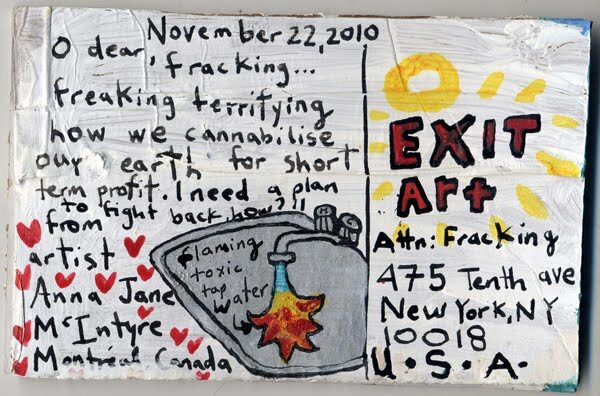 Exit Art invited the public to respond to the issue of fracking by submitting a postcard via mail with original artwork on one side and a written statement on the other. The dozens of responses we received will be on view, forming a collective call to end fracking; postcards will be accepted throughout the run of the exhibition and will be added as they are received. 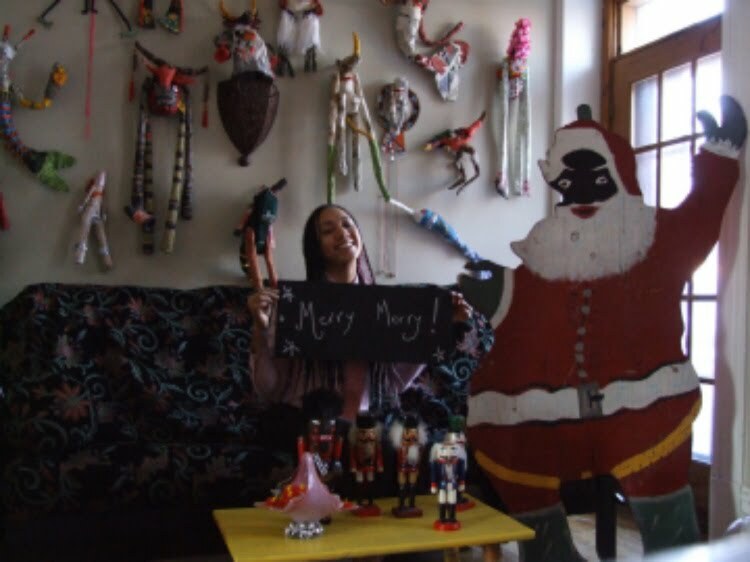 Organized by Lauren Rosati, Assistant Curator, with Peggy Cyphers, Ruth Hardinger, and Alice Zinnes. ooo I forgot about this. What a fun hour, a residency on a portable writing desk with typewriter that had a VERY LARGE FONT. 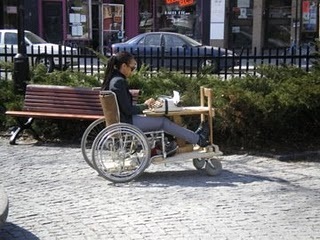 I wrote awkward love letters as I was wheeled here and there around the park at Mari Ann and St. Laurent, across from Leonard Cohen's house apparently, ha who knew? I just thought he chose that spot because it was pretty. Nomadesk where are you? Are you coming back to Montreal? 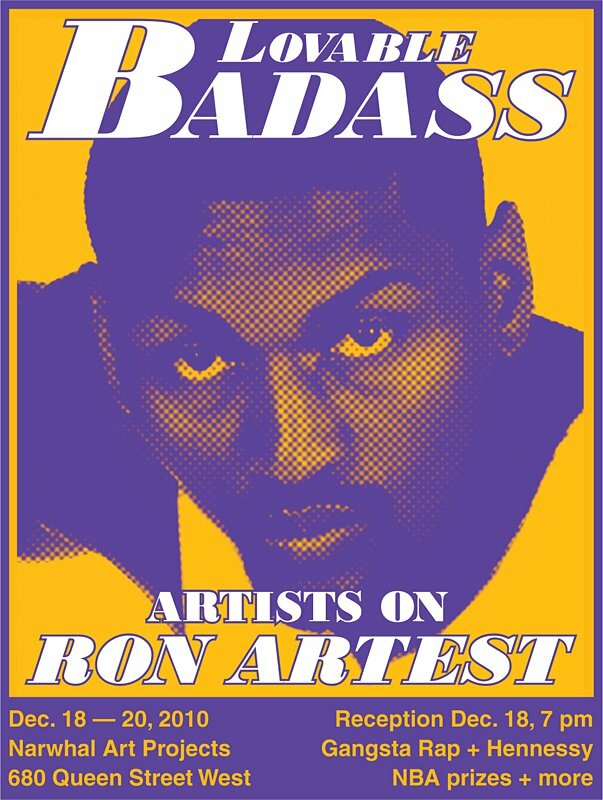 Lovable Badass: Artists on Ron Artest is a sweet show organised by the ever spicy Steve Manale. 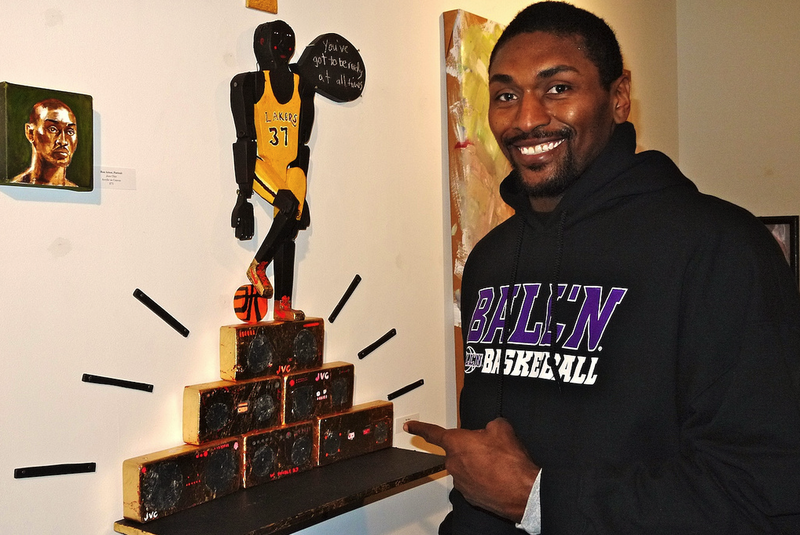 Look for my wooden Ron Artest doll perched on a wooden pyramid of old school boomboxes! Wow! The event was posted on Ron Artest's website! I went to see Don Quixote de la Mancha yesterday at Centaur Theatre in Vieux Montreal yesterday. It was so ....lovely! We gave them a standing ovation. The set design and props were just-how-I-like-them-gorgeous, wooden windmills, wooden bicycle horses and donkeys. The half mask use was fascinating. At first I found them too crude and then once I was used to them they were perfect, the actors used them so well, it was totally inspiring. 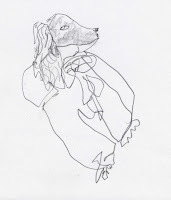 It was a play that was imaginative and lively and beautiful and silly. There was only one child in the audience though and the language was definitely directed towards adults. It was funny but once I started walking down to my seat which was right in front of the stage AA 33 (at one point the Don Quixote character's was standing squished in the aisle right in front of me, he apologised for having his bum in my face)..anyways I was looking around to see if there were any other black people attending besides me, to get a sense of the play's demographic. I couldn't see anyone else who was brown. At the intermission, the other play, A Raisin in the Sun, was also breaking and everyone was black. I almost felt like a traitor as we streamed in pairs back up the stairs heading back to our seats. At the top of the stairs the colours separated. Black people turned right, white people went left. I thought for sure someone would correct me and point me to the other play entrance. Thankfully, that didn't happen. 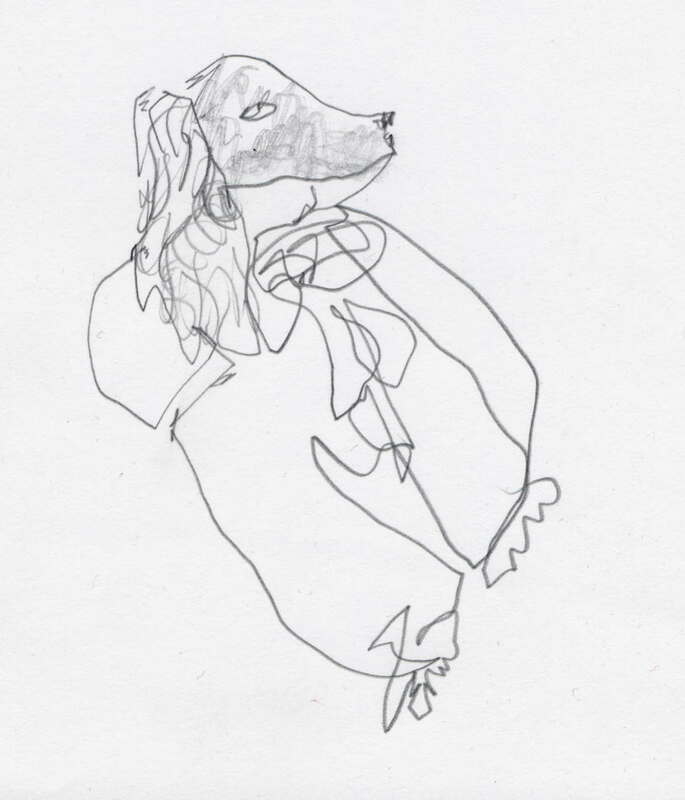 I was too enchanted to draw much, but here is a sketch of the dog costume. He even peed onstage!